This WordPress theme is 100% responsive (Bootstrap). It is has multiple home page templates and multiple gallery templates to showcase beautiful photography portfolio. It’s clean modern minimalist look is perfect for even the best photographer. It is flexible and easy to use. With two options for color scheme, and endless accent color options, its perfect for just about anyone. 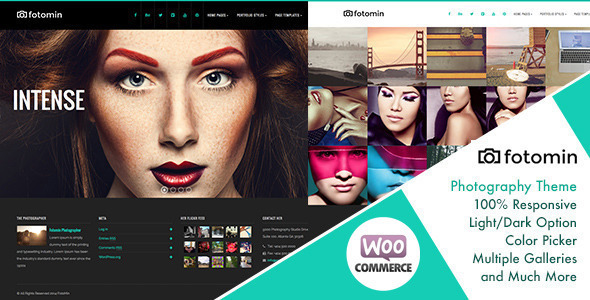 FotoMin is Now WooCommerce Ready. I am happy to answer ALL pre-purchase questions through comments. Real sites that use FotoMin WordPress Theme.